This press kit is designed to assist journalists and others with general park information, statistics and other background materials about Valley Forge National Historical Park. Valley Forge National Historical Park, one of more than 400 national parks managed by the National Park Service, is a 3,452 acre national park located approximately 18 miles northwest of Philadelphia. The park is co-managed with Hopewell Furnance National Historic Site in Elverson, Pennsylvania. Valley Forge National Historical Park is nationally significant as the location of the 1777-78 winter encampment of the Continental Army under General George Washington. Few places evoke the spirit of patriotism and independence, represent individual and collective sacrifice, or demonstrate the resolve, tenacity and determination of the people of the United States to be free as does Valley Forge. The historic landscapes, structures, objects, and archeological and natural resources at Valley Forge are tangible links to one of the most defining events in our nation’s history Here the Continental Army under Washington's leadership emerged as a cohesive and disciplined fighting force. The Valley Forge experience is fundamental to both American history and American myth, and remains a source of inspiration for Americans and the world. The purpose of Valley Forge National Historical Park is to educate and inform present and future generations about the sacrifices and achievements of General George Washington and the Continental Army at Valley Forge, and the people, events, and legacy of the American Revolution; preserve the cultural and natural resources that embody and commemorate the Valley Forge experience and the American Revolution; and provide opportunities for enhanced understanding. Public domain images of the park are available for use and download on our Flickr site. Please use the credit line "NPS". Read and download assorted park management plans. Read and download the Official Park Administrative History. May 30, 1893 - Pennsylvania Governor Robert Pattison signs legislature to acquire Valley Forge as the first state park of Pennsylvania. August 25, 1916 - President Woodrow Wilson signs the act creating the National Park Service, a federal bureau in the Department of the Interior. June 19, 1917 - The United States National Memorial Arch is dedicated in commemoration of the arrival of George Washington and the Continental Army into Valley Forge. June 27 - July 6, 1950 - The Boy Scouts of America Host the first National Boy Scout Jamboree since 1937 at Valley Forge parade grounds. President Truman and General Eisenhower both speak at the event. 1961 - Valley Forge is designated a U.S. National Historical Landmark. 1966 - Valley Forge is listed in the National Register of Historic Places. 1976 - Pennsylvania gives the park as a gift to the nation for the Bicentennial. 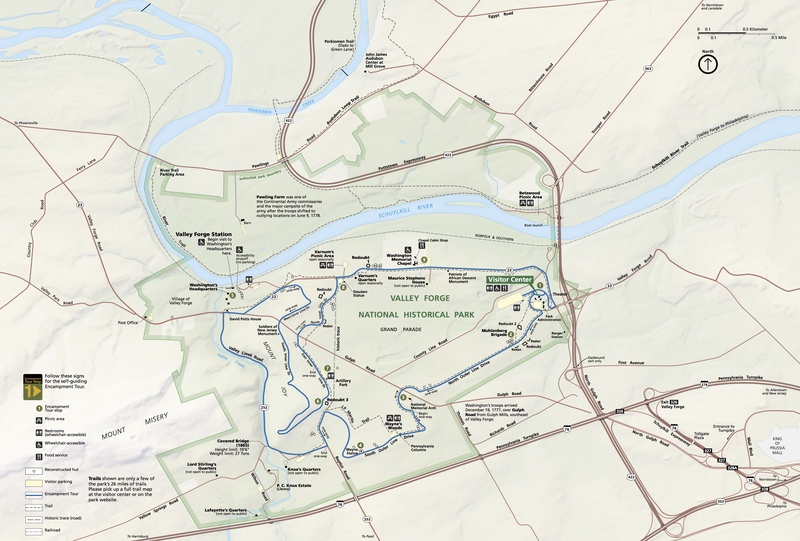 July 4, 1976 - President Ford signs into a law an act establishing Valley Forge National Historical Park as the 283rd Unit of the National Park System. March 31, 1978 - The Visitor Center at Valley Forge is opened, including a museum exhibit dedicated to the 1777-1778 encampment.